Today is Martin Luther King, Jr. Day, meaning that I have the day off (federal holiday). The last 10 plus days have been superb, and I feel like I'm learning so much about so many different things: politics, myself, the Spirit, and others. I knew this was going to be a great experience, but just how great I didn't know. I do many things as an intern in a congressional office. Natalia (the other intern) and I sit at two desks in the front. We answer phone calls, respond to mail, schedule tours, and a number of other things. Eventually we will be giving tours of the Capitol Building to Congressman Chaffetz's constituents, but we haven't been trained on that yet. Of all these tasks, I must admit that answering phones is my least favorite. I normally enjoy talking to people, but every call contains an unknown conversation for which I always feel uneasy. People call about every issue, ranging from healthcare to gay rights. Occasionally a we'll receive a pleasant caller who simply wants to share their appreciation and leave a good message. The reason these phone calls are so nerve-racking at times is because I feel unprepared. I'm trying so hard to keep up with issues and bills, and just when I think I have a hold on something someone else will call in about something I've never heard of. That opens up a whole new session of worry and study. It's actually quite fun, in the end, but pure panic fills my being when someone throws an unfamiliar issue my way. Working in the office has been surprisingly swell overall. Working with a former Viewmont Viking, Alisia Abegg Essig, helps a lot. I feel a little more at ease and she treats me very well. Many times I have felt like an infant learning how to walk, but Alisia makes me feel very welcome and capable. She's given me tasks that keep me occupied and that give me a sense of accomplishment. So, famous people I've met? Well, obviously I have met Congressman Jason Chaffetz. He invited Natalia and I into his office and spoke with us for about 15 minutes just about life. He expressed his appreciation for us coming to work for him and invited us to have an enjoyable time in DC. Jason, being a very politically savvy man, had an interview earlier this week with Dan Rather. WHAT? 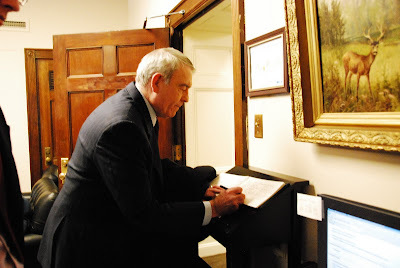 Dan Rather. You read right. It was awesome! Mr. Rather walked in and shook my hand. By the time he left he had shaken my hand three times. That is my nose in the picture of him signing the guest book. I was that close. I have many more pictures but no way to upload them onto a computer, so until I figure something out, you can enjoy the videos I've put on YouTube. If you can't find them from this site, type in bradybarrett7 in YouTube and you'll get my videos. I hope you find them entertaining. They show a variety of things, including my first day here and getting mixed up on the Metro. This week I have seen the White House, the Lincoln Memorial, the Washington Memorial, the WWII Memorial, the Smithsonian Museum of Natural History, the Smithsonian Castle, and the Smithsonian Hirshhorn Museum of Art. Yesterday (Sunday) after church my roommate Ricky and I went to the Washington, DC Temple Visitors Center for a fireside. A few recent converts gave testimony, and the main speaker was Brother Larry EchoHawk, the Assistant Secretary for Indian Affairs. It was a great meeting, plus we were sitting right outside the temple. It was raining (more like misting) and the way the mists shrouded the brilliant temple was a beautiful symbol to me of what this life is all about. It has been a blast here, and I am really enjoying myself. I've been blessed with good roommates and good people all around me. Bra-dy! You look so professional! I think it's so awesome you are out there and I'm jealous as jealous can be! How fun to work there...do you have to dress up all fancy schmancy every day? By the way, after you shook Dan Rather's hand...you haven't washed it right? Waiting for post 3! We love your updates!